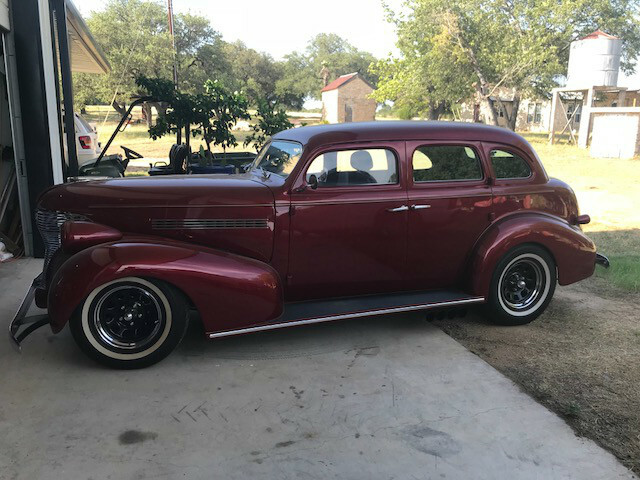 1939 Chevrolet 4 Door Sedan, 2 1/2" Chopped Top, 355 ZZ4 with a 700R4 Overdrive Automatic, New Edelbrock Electronic Fuel Injection, Ice Cold A/C, New Stereo9 with Back up Camera, power seats, This is a nicely done car that unfortunately had a little run in with a tree and now needs a right front fender and frame repair or re-subframed. It has an S10 subframe now. It is drivable around the yard and onto a trailer but not roadworthy as the front end is out of alignment due to the frame damage. This is a great project for someone with the ability to replace the subframe or straighten the existing frame. SOLD, It is off to Dallas with Larry who is going to give it the love it so needs and deserves.